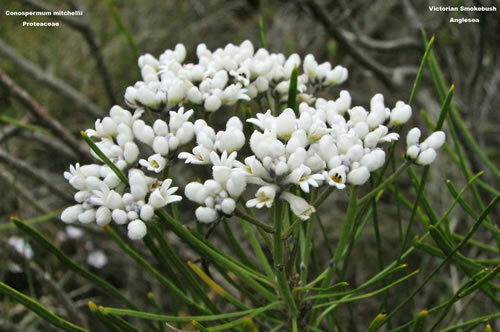 Selection and evaluation of eastern Australian Conospermum species as cut flowers: I. The western Victorian species C. mitchellii and C. patens. A.T. Slater Department of Primary Industries, Knoxfield, Victoria, Private Bag 15, Ferntree Gully Delivery Centre, Vic. 3176. 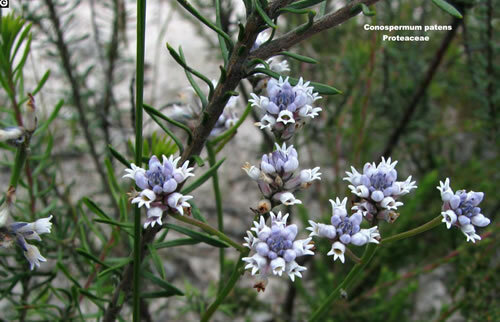 Conospermum mitchellii and C. patens are two particularly attractive species that are found in western Victoria and South Australia. These species produce terminal inflorescences with a long vase-life and would make attractive cut-flowers, particularly forms with blue buds a rare colour in cut-flowers. As a further advantage these species produce a subtle sweet aroma which would enhance their marketability. The size of the inflorescence of these two species would enable them to be used as a focal filler flower in mixed arrangements. Field surveys were conducted on both species to locate selections that had suitable characteristics for use as cut flowers. The character assessment was based on a range of physical characters; including, stem length (longer than 40 cm), inflorescence demography (width, evenness of floral display, evenness of floral maturity, colour and visual attraction), and fragrance. Material from 18 plants was collected for further assessment. The material that was placed in the post-harvest vase life trials exhibited consistently good vase life. Unfortunately the material that was placed into propagation trials failed. These two species of Conospermum, especially C. mitchellii, could be used as cut flowers if further work is done to improve their propagation rates and cultivation.